Efficient Kipping – Sorry to ruin the surprise, but your biceps will probably blow up during this one. Even though there aren’t many T2B in each round, 8 will still add up over the course of a 20 minute workout (I believe Sam and Kristin both just did 160ish). Even if you happen to get super-fatigued in the mid- to late stages of the workout, don’t waste time hanging from the bar. This will fatigue out all of the small stabilizing muscles around the shoulder joint and upper back, and cause even more chaos with your kip. Rest until you’re absolutely ready to get as tight as possible, get some good reps in, and then come back down before things get sloppy. Break Early – This is the movement that will get none of the credit if it’s on point, but will get all of the blame if it ruins your workout. Nobody will win this workout because of amazing toes to bar, but plenty of CF’ers will find themselves standing under the bar staring up wondering “why didn’t I go 4-4 or 3-3-2 earlier? !” Each person’s gymnastics capacity will be different. That being said, if your max set of toes-to-bar is <20, go hard in the other two movements, and plan on taking a good amount of “planned rest” during this one. Even if your max set of T2B is measured in hours instead of reps, you may want to consider only doing the first 4-5 rounds unbroken. Basically, once you feel any sloppiness in your trunk (aka “core”), and your kip starts to get funky, break it down into a smaller rep scheme of your choosing. 1 Armed DB Swing – I really feel like that sums it up. Sit those hips back, load up the hamstrings and the glutes, and swing that sucker up to your shoulder. The only movement your arm should be doing would be to pull you down under the DB after the hips come through. The weight should be light enough that a simple dip+drive from shoulder to overhead will not be an issue. Stay Tight – This movement will challenge you in the transverse plane, something we rarely train in CrossFit. As the dumbbell comes back down from overhead between the legs, you will need to resist the rotational force with your trunk and hips. If you get loose, you’ll quickly feel a massive back pump that will be miserable on the rower. Stay tight, Keep your Chest Up, and Hips Back. Don’t Curl The Dumbbell – I don’t think I really need to elaborate on this one, but I couldn’t sleep at night without adding it in. This will blow you up, and make your toes-to-bar miserable. Try to avoid using your arms as much as possible during this workout. Open the hips up – This is crucial. If your hips are stiff, you will need to rely on your low back and spinal erectors to do the majority of the pulling. This will not only make the DB’s much more challenging and fatigued, but will also throw off your rhythm on the T2B. Get into a good squat or deadlift position at the catch (beginning) of each stroke, and drive with your legs. 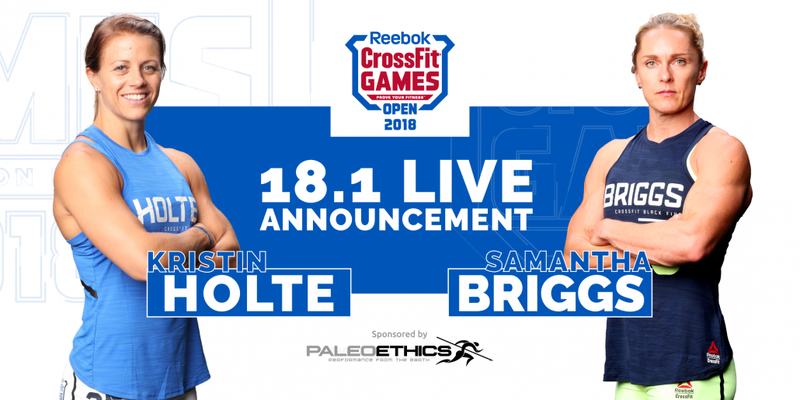 Big Pulls, ALL THE WAY THROUGH – One of the first things I noticed when Sam started gaining ground on Kristin (other than Sam figuring out how to do a DB Hang Clean on the spot) was that Kristin repeatedly kept trying to short-change the row calories. Do you ever do that thing where you tell yourself “1 more pull….okay, maybe just 1 more small pull…” and so on? In a workout with this many transitions, this will be a huge time waster. I would say she probably wasted 2-4 seconds per round doing small arm pulls hoping the rower hit 12. Sam was rowing like she was aiming for 14, and just jumped off when it hit 12. It is worth it to do one extra “big” pull and use those extra seconds for resting or transitioning. Pacing here is going to be highly individual based on strengths/weaknesses, so I’m going to break up two different strategies into two different “avatars” of people. “Toes-to-Bar Monster, Somewhat Slow of a Rower” – Unbroken T2B (or at least 5-3 or 4-4), Go easy on the rower and just try not to spike your heart rate. Think: 100%, 90%, 80% efforts on the three movements, respectively. “Rowing Animal, but Just Trying to Get Away From The Rig” – Be prepared to let people pass you in the beginning. Your not the most gymnasty person in the gym, but that’s okay (I’m talking to myself here, too). Break the T2B early into 2-3 sets, because there’s a good chance you’ll be doing doubles or singles past minute 15 if you don’t. If you read the movement tips above, get fast, crisp sets in, then drop down, breathe, and go again. Then try to crush the DB’s and the Rower, because there will be plenty of built-in rest breaks under the pull-up bar. Either way, the dumbbell should NOT hit the floor until you’re either done with 10 reps, or done with 5 reps at least. You can’t switch hands until you’ve done 5 on your first arm, so just try to get 5 done as fast as possible, and rest between arms if needed. Personally, I am going to try to limit the number of times I have to bend over and pick it up off the ground, so I will be resting a little bit extra both before and after those 10 reps.
Now, let’s talk overall pace per round. Basically, the rule for this one is pick a pace that might seem slow at the beginning, because it won’t feel slow at the end. You can always decide to pick up the pace once you’ve got the adrenaline butterflies out of the way in round 2-3, but if you blow up early, there’s no coming back. To find your individual pace, I’m actually going to recommend that you do 1 full round of the workout, at near-max intensity as the last real piece of the warmup. See how long that takes you, then plan on starting out at 75% of that speed per round. If you’re someone who paces things really well over long bouts of time, but isn’t that explosive through one round, you may start out closer to 80-85% of that max speed. If you can knock out one round in around 60 secs, you may want to start out somewhere around 60-65% to save some of that energy. Like I said, if you feel good after the first 2-3 rounds, you can start increasing your speed. But it rarely works the other way around – if you blow up by minute 6, its going to be a long 14 minutes. 20 minutes is going to be a long time. For that, we need to really tap into both the oxidative and the glycolytic energy systems. This is CrossFit’s version of the 5k run for this Open year (I’m assuming they won’t have another 20min workout, but you never know). 10min Easy Assault Bike, Jog, or Jumping Rope – Go 45 seconds Easy, 15 seconds Moderate Intensity. Just break a sweat, but don’t start burning or gasping for air. 20-30 Band Pull-Aparts – Get that upper back and shoulders warm. 10-15 Pushups to Downward Dog – Pause at the top to get a good stretch, and make sure your chest, shoulders, and upper back are opening up in prep for the toes-to-bar. Spiderman’s – in a pushup position, bring one leg up and outside your arm. Try to sink your elbow down to the ground, then reach back up to the ceiling. Switch sides, and repeat. Twisting Lunges – lunge left, twist left, lunge right, twist right, repeat. At this point your heart rate should be spiked pretty high. Allow 10-15 mins to let it come back down. Grab some water, but don’t get cold. Keep doing any general movements that you feel work for you before a workout. If you have 15+ minutes of down time after you finish the warmup, you may need to hop back on the Assault Bike and just keep it spinning to keep from getting cold. At this point, you should have a good idea of how this workout will make you feel, and what pace you are actually capable of maintaining. All that’s left to do execute.